It's that man Mosley again, this time suggesting that Michael Schumacher would win a straight contest with the rookie sensation of last year, Lewis Hamilton. We all like to indulge in these hypothetical questions, pitting stars of yesterday against those of today and Max's opinion is as valid in such musing as anyone's. But the reasoning behind his choice is flawed, to say the least. Apparently, Max thinks the Shoe's team mates were "almost all very strong, and some of them were tremendously strong — but he was always the strongest." That is an interesting point of view, considering the consensus is that Michael made pretty sure that he was never teamed with a driver who might seriously threaten his position. Andrea de Cesaris - I liked Andrea but he was always a little out of his depth; Nelson Piquet - in his last year of F1 and definitely past his sell-by date; Riccardo Patrese - quick on occasion but never one of the best; Jos Verstappen - I would like to think that Jos could have been great but sadly he was never given a decent chance to develop; Johnny Herbert - the great might-have-been if only he hadn't ruined his ankles in a pre-F1 crash; Eddie Irvine - always good for a laugh, but never in the top flight; Rubens Barrichello - honest, competent, but lacking the flair of the fastest drivers; Felipe Massa - greatly improved by learning from Schumacher, he was never a serious threat. That is not exactly a list of the strongest drivers in F1 and most of them were in decline or yet to realize their potential. Compare that to Hamilton's only team mate so far, Fernando Alonso - double world champion and at the height of his powers. I am not arguing on the outcome of this suggested contest - it is not something we will ever know the answer to and I doubt that we have seen the best of Hamilton as yet anyway. Max's reasoning strikes me as inaccurate at best, however, and I suspect that he is swayed by the Schumacher record of titles and race wins. Which is hardly a relevant measure since we have no idea what Hamilton's tally will be by the time he retires. Perhaps a more interesting way to look at the Shoe's talent is to consider the thoughts of those who competed with him. Jean Alesi left Ferrari, rather than be number two to Michael - surely evidence that he thought he could beat the man if given an equal opportunity. Johnny Herbert mentioned that he was never allowed to see Michael's settings, although the same did not apply to Michael. And we all know that Irvine and Barrichello were given their drives on the understanding that Michael was top dog. As a result, comparing Michael with his team mates in a quest to assess his real ability is a fool's errand. It is in his performance on the track that we see just how capable he was - and there is no doubt that he was one of the quickest drivers of his era. I will grudgingly admit that he has put in several race performances that can be compared with Senna's. But we cannot do the same for Hamilton yet - one season is not sufficient evidence to make a judgement on. Steven Roy thinks that Hamilton will prove to be one of the all-time greats of F1 and I would not disagree with him. It is more in my nature to wait and see, however, and I make no prediction at this stage. Much more to my taste is to seek out the unregarded drivers, looking for that one amongst many who exhibits the spark that sets him apart from his peers. And in that vein, I'll repeat: watch Kazuki Nakajima - he is going to surprise everyone. What amazes me is that you even consider the possibility of Max actually saying something that makes a little sense. Isn't it a little strange that Mosley finds it necessary to get involved in this kind of discussion? To be fair to Max, he was asked the question. But he is so easily drawn on this kind of thing that it's tempting to think he just loves giving his opinion on any subject at all. It's typical of Max to make such a stupid statement. There is no way anyone can say at this stage which is the better driver but to use his team mates as a basis for saying Michael was better is extreme stupidity. People seem to remember the incidents with Barrichello in Austria but it has to be remembered that it was Irvine who used to refer to 'receiving the phone call' to move over. I remember his expression when Salo moved over and gave him the win. I think that either Max said it without thinking which is unlikely or he had a point to make. The only possible thing that can be taken from it is that Max doesn't rate Alonso or at the least is trying to wind him up. One teamate you missed Clive was Brundle who was his team mate on the day of Michael's first win at Spa. Brundle had been ahead and went off the road with badly worn tyres. 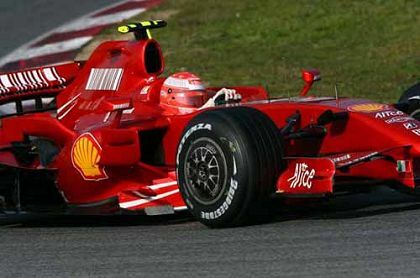 Schumacher was aware enough to notice the condition of the tyres and pit for replacement tyres. These amusing musings from Max just go to show that he isn't really a true fan of the sport. Like the CEO of a lingerie company, he knows as much as he thinks he needs to know and doesn't really use the product himself. I wonder how many races he bothers to watch? In my mind Schumacher's legacy will always have an asterisk behind it in a way that Prost, Senna, Hakkinen, Mansel, Villeneuve, and all of the great champions of the past won't. His team situation was always "engineered" and it always smacked of cowardice to me. Not to take away from his skill, but it left the sense that some of his confidence derived from being made King. If I'm not mistaken, Irvine gave his trophy to Salo in thanks, something that I don't think would ever occur to Schumi. As for a shoot-out, didn't Hamilton top the times against the Ferraris in testing day before yesterday? 'Nuff said. Schumacher did once try to give his trophy to Barrichello on the podium after he had been gifted a win by team orders but the FIA threw a fit as a result. Looking back, I think Schumacher wasn't quite as bad as his actions seemed to indicate on occasion. His philosophy was to win whatever the cost and selection of team mate, shoving others off the track and ruining the odd qualifying lap was all a part of that. And he was right - his record speaks for that. It will be interesting to see whether Hamilton can achieve as much without using the dirty tricks. I think that one of the reason that Lewis ended up with such a huge wave of popularity (taking the British out of it) is because he seems "clean," like he wouldn't stoop to those levels. Mind you, there's something to be said for the win-at-all-costs attitude. Senna wouldn't have been the driver he was without his, well, drive. But it brings back the idea of the gentleman racer who has the courage on track and the manners off, a bygone era. I forgot about the example you gave, but it just shows, once again, that certain key players just don't get it. There's a myopia there. Schumacher always said he didn't care about history. If he did, he wouldn't have been as ham-fisted about it. Quietly acknowledging your team-mate's sacrifice in private while maintaining the illusion in public allows the fans the flimsiest excuse to sustain our disbelief that we aren't being hoodwinked. A clumsy public display that shows that it is really a sham and the fix is in just looks bad from every angle. And I hardly think that Max has a great awareness of the history of the sport. I'm not holding myself up to be an expert in any way, but I'm not the President or the "Greatest driver ever." I never really understood the fuss over team orders. There was a time when, if a team held the first few places (and multi-car teams were common in the early days of F1), they would have them go over the line three or even four abreast. It was a demonstration of how crushing the team win had been, a way of rubbing your opponents' noses in it. Nobody made a stink about how stage managed it was. I suppose the greater visibility of the sport has made the personalities more important and now large numbers of people support individual drivers, not being ready to see their heroes having to give way for the sake of the team. That I can understand - a driver deserves a reward for his efforts - but the old way gave recognition to the less visible members of the team that made any victory possible. The FIA have proved quite resistant to public pressure at times and it surprised me when they gave way over the matter of team orders. It was a bad mistake, giving rise to loads of silly accusations, culminating in the farce of the Monaco investigation last year. Call me cynical, but it just seems different when a team has one driver emerge as having the clear advantage and throwing all of their support behind him to win, or creating a team that is solely focused on one driver and the other guy's only task is to hold up the rest and get points for the Constructor's. Ron Dennis may take the equality thing a bit too far for some, but at least he has principles that he lives by and won't bend. The other short guy in red has only one guiding principle: win by any possible means. In my mind it cheapens the sport, as the events last year have truly done, despite Max's fantasy that his witch-hunt helped F1. Schuey's team mates all drove with the equivalent of one arm tied behind their backs. Sadly, Mad Max is not the only person to be completely ignorant of this fact. Most of my friends who are into F1 are Ferrari fans, and they will not even contemplate the idea that Schuey won in anything other than a fair fight. Max once again put his foot in his mouth but at the same time we have raised a new subject or two. Team orders-- Max knows that it happens but doesnt have the guts to fine teams who do it. The teams that do it are another. First look at who does it the most- Ferrari- does it help them win? YES. Shue never met a driver that he did not want to run off the road. His teammates on the other hand new that if they did not let him go by they would be looking for work next week. When Shue tried to give his trophy to RB Max went ballistic his face got red and his ears became pointy. We all knew what happened in that race except the FIA. I could on about this with all the teams but I want to get to my next point. Sportsmanship- In all of autoracing F1 drivers are akin to royal knights. They are looked upon as WWII fighter pilots. We think that they should act like them to with chivalry as their guide. No other form of racing do we feel like this. Would we ever consider a driver like Tony Stewart in NASCAR a knight in shining armor as he pushes someone into the wall at 180mph! Because we feel this way about our drivers we feel that we are involved with royalty. I guess this is were the elitist attitude comes from. The only other athletes that F1 drivers are related to in our eyes and the press is Golf. Imagine that we think they are as gentlemanly as golfers. I know that I have gone along way for an analogy but here it is. I look at Hamilton like I do at Tiger Woods. Only in the fact that they are both sensational athletes as well as decent people. I can never say that Tiger is better then Jack Nicklas because he never played Jack in his time. We can have the discussion of who was better over a pint but no one is right. These hypothetical comparisons are good for discussion only and Max really should have kept his mouth shut. But what really gets me is that he actually belives what he said. I realize that he pumped up all of Shue teammates over the years but I am also sure that most of the teammates see it for what it really was. Whatever team MS was on it was MS's team period. Regardless who was in the "other" car Shuey was in charge. So Max's "bar-room" banter had no support. So do you think Max is hoping that there is a huge number of people who are going to come out and say Lewis would blow away Schumacher? That would force Michael to come out and defend his honour - assuming he has any. The big problem with that is that he would have to take on Kimi in the same team and Kimi is going to divert any phone calls to voice mail. Besides Schumacher wouldn't fancy racing without Brawn, Byrne, Stepney and co. Unless Brawn can work miracles at Honda then I think we have seen the last of Schumi which is not something I thought when he retired. I thought he would be back. Of course if Alonso has signed for Ferrari next year there could be a decent seat available at Renault and Flav would love to have Michael back. Of course Piquet probably wouldn't take the phone call either. Oh, Michael won't be back - once he's decided to stop, he stops (witness Monaco 2006). But that doesn't stop Max and Bernie from trying! In fact, I'll bet Bernie put Max up to this - probably fed the interviewer with the question too! One more driver you missed, Clive, was JJ Lehto. But they drove only a few races together in 1994 due to a preseason testing accident. But even Jos did better than him when they paired up during Schumi's 3-race ban. I propose an investigation into how Mr. Mosley came to this conclusion about Master vs Meister - and to find just who handed over the telemetry data from Ferrari and Mclaren to grace him with this definitive point of view. There were rumours a while back about Schumacher coming out of retirement but I think it's been put to bed now and there's no chance of it. Maybe that's what Max was trying to do though and a fight between Hamilton and Schumacher would certainly be interesting. I have to agree with Max that Michael would beat Lewis but I disagree too that his teammates were all strong - they were a bunch of average drivers at best (Barrichelo and Massa aside).